Bobby Norfolk's energetic interpretations of 5 well-known stories seem to burst from the speakers. Norfolk's voice commands attention as he speaks, shouts, and vocalizes various sound effects. Norfolk's strength is in moments of wild humor, but he successfully conveys the emotion in stories that are more serious or, in "Tilly and the Eight Steps," mildly frightening. These strengths are brought to bear on stories that entertain and have a strong moral center, making both this collection ideal for young and old alike. 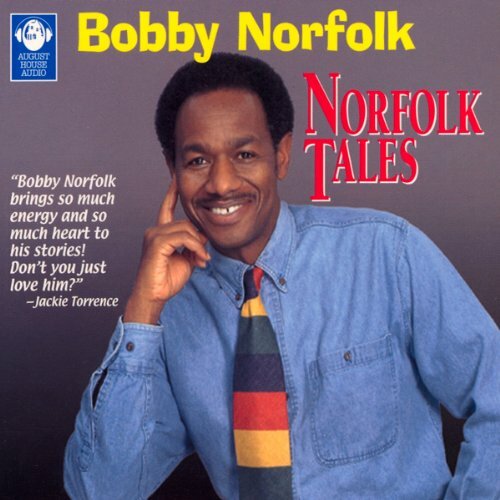 Emmy Award-winning storyteller Bobby Norfolk brings his electrifying energy to world folktales (from the African, Eastern European, Appalachian, and Irish traditions) to the delight of all ages. From Anansi, the African trickster, to Jack, the bumbling, lucky, persevering Everyman of traditional stories, Norfolk's characters instruct while they entertain. © Bobby Norfolk; (P) August House Publishers, Inc.
Bobby Norfolk's storytelling keeps me and my children (4&6) entertained and laughing. His storytelling performances are totally unique and hilarious. This is one of our favorites. Our pick on this collection is "Tilley and the 6 Steps." We love to try to imitate his voice when he booms, "Tilley, I'm on the first step....!" All of his Anansi stories are incredible. See other collections for those.